Four out of every five profiles on Instagram are said to be following at least one business account. So, this news about direct checkout from Instagram will present the business community with a lot of potential opportunities. Can you start implementing direct checkout from Instagram right away? Soon, hopefully. Direct checkout for tagged products on Instagram are still in closed beta – meaning they are being tested through invites only. Recently the shoppable posts or tagged products on professional accounts of Nike, H&M, Addidas and a handful of other companies are only seen with the Checkout on Instagram button. What are the benefits of having Checkout on Instagram? If you already have the shoppable posts on your Instagram, currently, you need to send customers back to your site. And every next tap or click required on the conversion funnel is a hurdle. Checkout on Instagram reduces the path on conversion funnel helping sellers get more sales. Mobile social media account is the paramount of social proof for any business organization. The number of followers and comments, likes and other social KPIs indicate how well a business is perceived by the community. Let’s look at the data now. Almost 130 users click on the Instagram shoppable posts every month. That’s huge. And since September 2019, it has seen a growth of around 40%. Looking at the product details and having to leave the app to buy product on website is somewhere between lazy and tedious. Checkout on Instagram helps to grab the real value of Instagram shoppable posts to boost conversion. As the news goes, Checkout on Instagram is soon to come, no ETA provided! So, what are the preparations required to get the benefits of this as soon as it goes live? 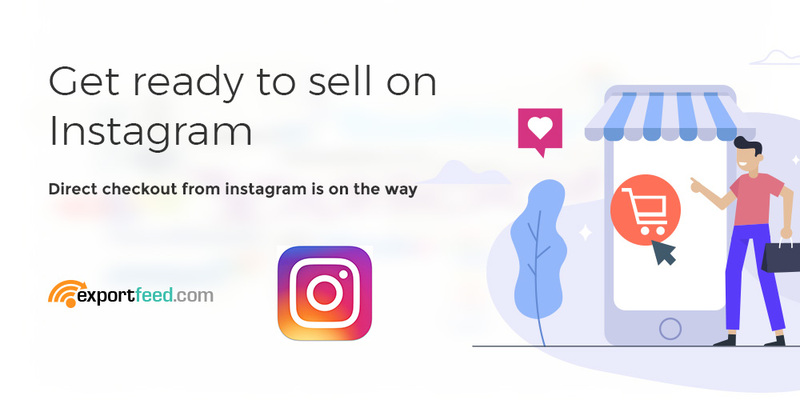 How to get ready to sell on Instagram? Grab the best that you can have – Start creating Instagram shoppable posts now! ExportFeed can help you to create you eCommerce catalog for business.facebook.com. You can create product catalog based on the category or collection of your eCommerce products or you can also custom pick products to include in the catalog. Apart from that, you can also customize the product attributes of your eCommerce site. ExportFeed offers you more useful features including customization options but you’ll have to try it to find it out.